The FHD-XS redefines the meaning of the word portable. This is the way mobile storage is meant to be: small in size, lightweight, robust aluminum design, large storage capacity, bus-powered and no additional cables required. This pocket sized, extremely fast drive, installs in seconds, is hot swappable for maximum flexibility and connects to any PC with a USB 1.1 or 2.0 port. A driver is not required, so just plug and go. 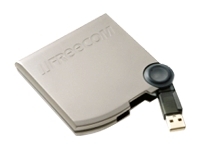 The FHD-XS comes with two convenient applications: Freecom's One Button Data Synchronization for automatically synchronizing files between FHD-XS and your computer or network; and Acronis True Image (for Windows only); this software can replicate an exact image or indeed separate partitions of your hard disk drive for complete backup, allowing you to restore all of their contents, including operating systems, programs, personal data and settings.